CD review: "Beat It, Blow It, Strum It, Hum It"
This review first appeared in the July 31, 1992 issue of the North County Blade-Citizen (now North County Times). If you wanted to pick the ultimate American band, you'd first find a combo that could play all the American musics: jazz, bluegrass, gospel, blues and country. Then you'd look for excellent musicianship, a good ear for arranging, and a sense of timing that never missed. When you finished with the above, you'd probably have an outfit very close to the Sunshine Skiffle Band. This set presents most of the above musical styles, all played with verve and talent. 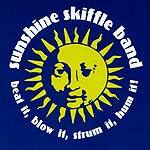 From the country standard "Orange Blossom Special" through Tampa Red's blues classic "Tight Like That" to the uniquely American "Jug Band Stomp," the Sunshine Skiffle Band romps through a veritable history of American indigenous musics. The instrumentation is pretty darn American, too. How many bands have a gutbucket (washboard bass) as the lead instrument? Or include a musical saw, a kazoo, a genuine jug, banjo, washboard and slide whistle? It's refreshing to know that one doesn't have to travel to rural Illinois on the Fourth of July weekend to hear music like this.